Public law has been conceived in many different ways, sometimes overlapping, often conflicting. 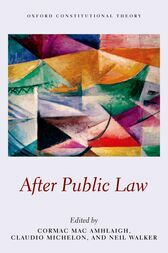 However in recent years a common theme running through the discussions of public law is one of loss. What function and future can public law have in this rapidly transforming landscape, where globalized states and supranational institutions have ever-increasing importance?The contributions to this volume take stock of the idea, concepts, and values of public law as it has developed alongside the growth of the modern state, and assess its continued usefulness as a distinct area of legal inquiry and normativity in light of various historical trends and contemporary pressures affecting the global configuration of law in general.Divided into three parts, the first provides a conceptual, philosophical, and historical understanding of the nature of public law, the nature of private law and the relationship between the public, the private, and the concept of law. The second part focuses on the domains, values, and functions of public law in contemporary (state) legal practice, as seen, in part, through its relationship with private domains, values, and functions. The final part engages with the new legal scholarship onglobal transformation, analysing the changes in public law at the national level, including the new forms of interpenetration of public and private in the market state, as well as exploring the ubiquitous use of public law values and concepts beyond the state. A useful, reflective contribution to a subject whose importance goes well beyond academia. Cormac Mac Amhlaigh is a Lecturer in Public Law at the University of Edinburgh School of Law. He received his PhD from the European University Institute and his research focuses on UK constitutional law, public law and constitutional theory, the relevance and use of public law concepts beyond the state, and the theory and practice of human rights law.Claudio Michelon is Senior Lecturer in Law & Legal Theory at the University of Edinburgh School of Law. His current research focuses on legal decision-making, legal epistemology, and private law theory. He is the author of Being Apart from Reasons (Springer, 2006) and Aceitação e objetividade (2004).Neil Walker holds the Regius Chair of Public Law and the Law of Nature and Nations at the University of Edinburgh. He is the author or editor of numerous volumes, including The Paradox of Constitutionalism (with Martin Loughlin, OUP 2007), Europe's Area of Freedom, Security, and Justice (OUP 2004), Civlizing Security ( CUP, 2007) with Ian Loader, and Europe's Constitutional Mosaic ( Hart, 2011) with Jo Shaw and StephenTierney.